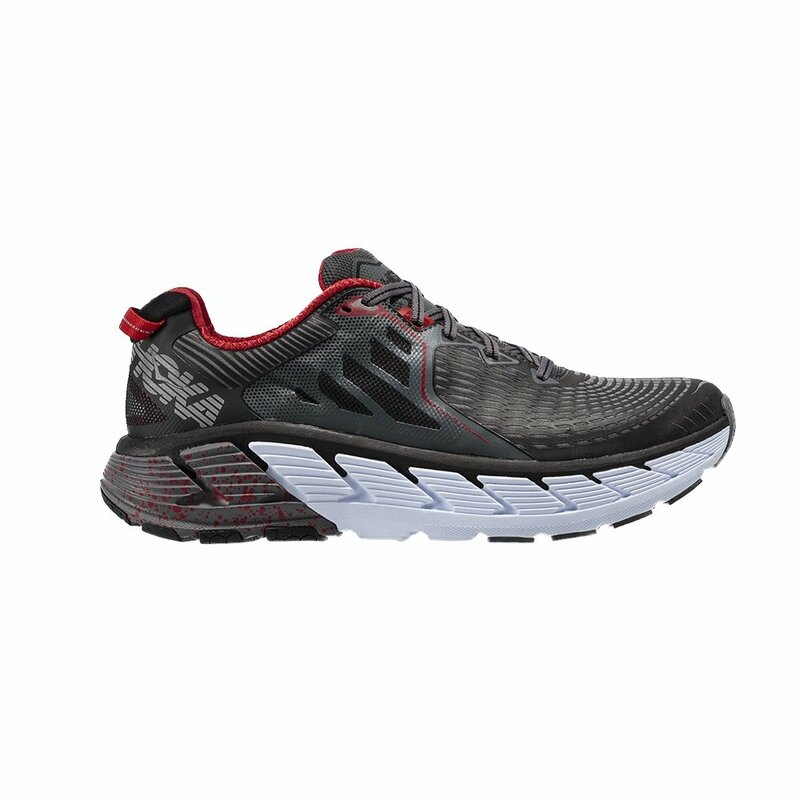 Hoka ONE ONE's Gaviota Running Shoe are now available for runners who need a bit more support but still want to take advantage of Hoka's legendary cushion and comfort. It's built on a Flat-Waisted Design that gives you a broad platform to rely on, minimizing pronation without compromising stability. That way every step can be comforted with the cushion of the 3D Puff Frame midsole, and push off powerfully thanks to the Late Stage Meta-Rocker Geometry of the rubber-reinforced outsole. I was definitely skeptical of the whole brand when they first came out, like many others. But they gained popularity and started making soles that weren't just white (with size 15s it would look like running on two temperpedic mattresses). Then I got desperate as I started struggling with both plantar fasciitis (a little) and mostly achilles tendonitis. I tried about 5 or 6 different shoes or brands and nothing was really helping. Hoka looked more appealing for the cushion... but they are just really expensive. I decided, after saving up, I would give them a try because of their 30 day guarantee. It's been longer than 30 days, I only just crossed over 100 miles, but I have had no major flare ups of the achilles tendonitis with the combo of the Gaviotas and some stick massages! I will probably make the commitment to stick with Hokas for a long time! Would be a good shoe if they made it wide enough. Once again it's a Hoka shoe that is too narrow in the toe box and they don't make a wide in this shoe. If it wasn't for this I probably would've kept them. I've never had to look at wides in any other brand of shoe. Constant issue with Hoka. Great shoe for pronation. Comfy with lots of cushion. Full toe box. Thanks for the wide width. I have owned 2 pairs of Arahi and have loved them. I have had the Gaviota for just over one month and the tread is already more worn than my 1 year old pair of Arahi. I only use these at work and for minimal walking. This is actually the first pair of running shoes I've ever bought, but I'm training for a half marathon and the pronation on my right foot was killing my hip. This shoe was an instant fix, my hips feel so much better, my heels don't slide around anymore, and I don't feel like I have to compensate for my imbalance. It is heavier than I'm used to, but not terribly so. The best thing about this shoe was that it actually comes in my width! I'm a woman so for me it's rare to find shoes that actually fit me correctly (given up entirely on women's running shoes/sneakers). The only thing is that since I only pronate on one foot, I am developing some blistering on the other but I'll live. It's worth it to feel like I'm not going to fall off the sidewalk. I love the responsiveness and the cushion about this shoe. I used this on my ultramarathon and cushion really held up to its name. quite bad when I went to the store the wide version isn't available so I bought the regular, but it was still ok, and could have been better if I had the wide version. Great product. The problem is that this is third pair I purchased. 2 of them have the rubber on the button of the shoe fall out after 6 month. I only use the shoes to walk. No exercises. It happens in the Same place. Piece of rubber falls off from the middle of the shoe where it touches ground. Please fix this. Went through all the major brands including the Hoka Conquest and Constant. The Gaviotta provides sure footing and wide stance. Feels denser than most of today's feature shoes which offer lightweight but no support or cushioning. I really like this model. Running pain free for first time in 12 years! After three ankle reconstruction surgeries and lumbar fusion, I thought my running days were done. I have been unable to even shuffle pain free since leaving for Iraq in '06. Hoka was recommended to me by an ultra-marathoner. So I gave it one last ditch shot. From my first shuffle back on the road to my 10th run now, I am pain free. No ankle pain, no radiating nerve pain, no L5-S1 joint pain. Thanks to Hoka, I can run with my sons before my oldest leaves for college. Thanks, Team Hoka for giving the ability to hit the road again! I had back surgery and these shoes provide the cushion and support I need. I wear these shoes every day. Trialed these for a day (wanted to upgrade from Brooks Beast) and then had to return them :( The side profile of the shoe would suggest ample cushion, but I can tell you the illusion of cushion does not translate to actual shock absorption for the road! The Bondi's I've trialed had supernatural cushioning, but neutral stability; these have the stability rating I need but sub-Beast cushion... back to the BEAST! The Gaviota is extremely comfortable on any surface while providing stability. I have worn Brooks Beast for many years, but was looking for a shoe to wear as a comparison shoe. The Gaviota compares favorably due to the additional cushion and softer, smoother running experience. I like both shoes, but I wear my Gaviota more often now. I am a pretty avid fast walker and have had some issues with my feet (planters fasciitis). My Podiatrist gave me a prescription for a stability shoe. The Hoka One One Gaviota was one of three shoes the shoe salesperson brought out and it was the most comfortable one for me. Although the shoe felt a little tight across the top of my foot. I've never bought a wide shoe before, but tried the Gaviota in a wide and the fit is perfect. I feel like the regular shoes run a little smaller in width. I've had my shoes for 3 weeks, have walked a 5K and I average 10,000-15,000 steps per day in my regular walking. While my feet are still healing from planters fasciitis, these shoes have helped me return to my normal walking. I really love these shoes and my only complaint so far is that the wide shoes only come in two color combinations. I'd like to see all Hoka One One shoes come in wide in the full spectrum of color combinations. I would also like to see them come in solid white and solid black leather so they can be worn by people who work in jobs with dress codes. Even if these are by special order, this would be of great benefit to customers and provide higher sales volume. I would definitely get these again. I got this shoe for long distance training. I've had these for about 3 weeks now and run about 40-60 miles a week and enjoy this cushioned shoe with every mile. I really like how light they are and the "3D Puff Print Frame for Additional Lightweight, and Detailed Support" they provide. Also like how the RMAT J-Frame offers great support, awesome rebound and exceptional durability during my runs. Please remove pop-ups from my IP address. I have been bragging to enough people that you should get more sales from this area of the country. Most comfortable shoe I have ever used for running. This is my 2nd pair. I used run marathons and ultramarathons. I used to run with conquest due to their stability and cushion. Because Hoka discontinued the conquest, I decided to try the Gaviota based on their supposedly high stability and cushion. The Gaviota give stability, however these are flat and do not give a lot of cushion. So if you are looking for cushion these are not a good option. The Gaviota are too tight at the mid area, making them uncomfortable after a couple of miles. The only way to improve this issue was to lose the shoelaces at the point that the shoes feel loose. I do not recommend the Gaviota. I will be returning the new painI just bought. The Gaviota are not worth it. It's a shame Hoka discontinued the Conquest. I have had Hoka shoes before - this version just was not true to size.